Stay focused on the task you are working on by displaying it in a small customizable window. 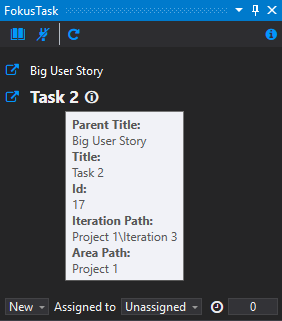 Connect to projects hosted on premise or online (VSTS) and filter by iteration, area or assignment. Stay focused on the task you are working on by displaying it in a small customizable window. 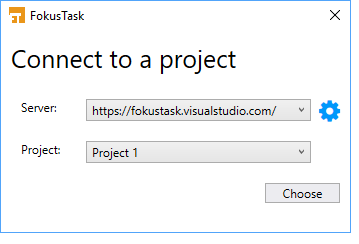 Connect to different projects hosted on premise or online (VSTS) and filter by iteration, area or assignment. Choose a specific task or bug and have it in your IDE to keep track of its status, remaining time and Assignee. We are aware that some people are experiencing issues connecting to a TFS On Premise server with FokusTask while being logged on with their Microsoft Account to Windows. If you truly want to experience FokusTask, a known solution for now would be to log on a local account.